Starting the season with a disappointing 1-4 record and scoring just four goals hasn't been great, but they are not playing bad hockey. The Arizona Coyotes know they're playing better than average hockey, yet they have only won a single game and that was in overtime. 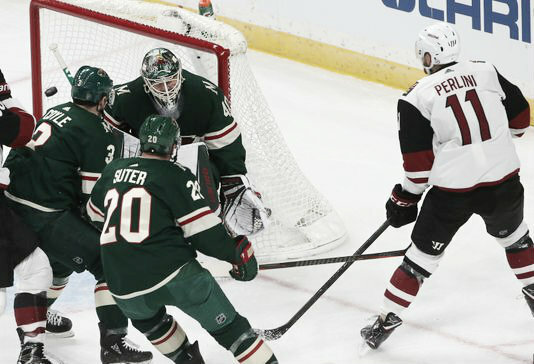 The sage continued Tuesday night as the Coyotes faced a tired, short-handed team in the Minnesota Wild. The Wild had just played the night before in Nashville and lost 4-2. The Coyotes took the lead at 13:12 of the opening stanza on a pretty power play goal by Brendan Perlini. As he skated in untouched from the right faceoff circle, the sharpshooter had a very slim opening above goalie Devan Dubnyk's left shoulder and planted it for his first goal of the new season. The Wild managed to tie the game at 3:40 of the middle period on a fluke goal by Mikael Granlund that came in on Coyotes' goalie Darcy Kuemper and fooled him on the glove side. In the replay, it appeared like a knuckleball as it dipped unexpectedly. That left it to Eric Staal to get the winning goal in the final period on a scramble in front of Kuemper. Overall the team is playing well by outshooting their opponents and having excellent possession statistics. They're not getting the bounces? Perhaps a combination of both, along with being short-handed missing their star addition Alex Galchenyuk who is close to returning to the lineup as he practiced with the team in Minnesota. And don't forget they have been without center Christian Dvorak who has yet to play a game this season struggling with an injury. His progress was hampered as his recovery sustained a setback while practicing. Being shut out twice on home ice is not appealing and the team must figure out how to score more goals. They need to get in front of the net for deflections and screening the opponent's goalie more. These are all fundamental things they can practice and improve upon. Head coach Rick Tocchet has not been upset with his team's effort, as they have been in every game this season. The defense and goaltending have been solid, (4th best goals against average in the NHL) now if they can get the puck over the red goal line a bit more often, the wins will come. Plays like this excellent chance by Oliver Ekman-Larsson ​need to get in the net... it's just that simple. The team must now face three tough opponents in the Chicago Blackhawks (3-0-2), the Winnipeg Jets (3-2-1), and the Columbus Blue Jackets (3-2) before this four-game road trip concludes. Winning at least two of these games is essential to jump-start the offense which, to say the least (last in the league) needs to crank it up. Perhaps playing the high-flying (pun intended) Jets will get the shooters on target again... one can only hope. It's still early in the campaign, but it's time to eliminate some of those zeroes on the scoreboard. Take someone like Derek Stepan. He has 22 shots on net this season without a goal. That's both amazing and frustrating... and he's getting good chances in close, but has yet to put one in the net. It takes patience and hard work... and the former must be running at a very low level. A nice six-goal game would definitely be in order. 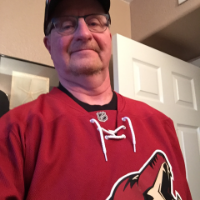 Do you think the Arizona Coyotes will find their offense and score more goals? Let us know in the comment section below, and make sure to give us a follow on Twitter (@VAVELNHL_ENG) for more updates!